If you were asked to name 400 of Suffolk's 500-odd parishes, there's a fair chance you wouldn't think of Stanstead. 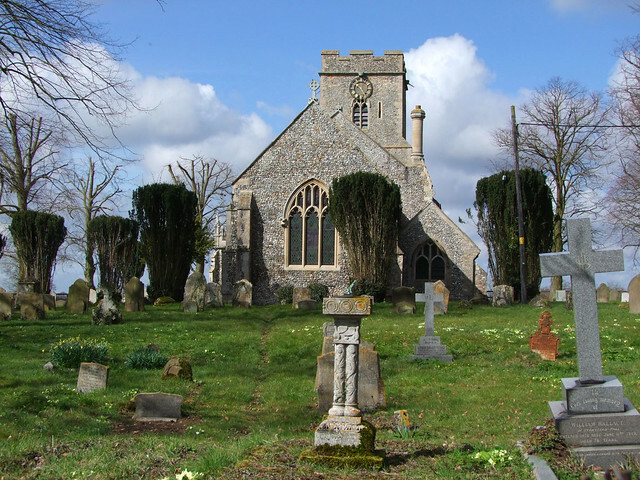 The village is a quiet backwater, straddling the main road on the outskirts of larger Glemsford, but the church of St James is on the hill above, looking out over the valley. You can't help wondering how many people looking for Stansted airport, twenty five miles off in north Essex, absent-mindedly type this spelling into their GPS and are surprised to end up in the middle of nowhere. I'd last been here about ten years previously, and it was a delight to roll up on a sunny morning in April 2013 and to find St James in such fine fettle, the churchyard full of primroses and celandines, the church open and welcoming. A few years previously I'd been told by a usually reliable source that this church was threatened with closure by the rather eccentric Rector whose benefice covered the parish at the time. He felt that not enough people were coming to hear him preach. The irony is, of course, that St James is still open to pilgrims and strangers everyday, but that minister's main church across the valley in the largest village in the benefice was, and is, kept locked. And St James is the lovelier church, I think. Cautley treated Stanstead with considerable disdain during his great survey of the 1930s, but the High Victorian character that he so abhored has matured, and here at St James is to be found in full flower. With a sweet irony it is the priest's door in the chancel which is kept open. It is directly into the chancel that you step, so you might not notice the original 14th century south door, with all its fittings. It's worth a look. Internally, the chancel is of good, honest rural 19th century quality, from the sequence of tiles in the sanctuary, which are surely an indication of the hand of diocesan architect Richard Phipson, to the memorials to Rectors Samuel Sheen pere et fils - this is grand Victorian Gothic writ homely. The tower makes the church appear larger than it is; inside, it is tiny. On the north wall is a good set of Queen Anne arms, probably the single most interesting pre-Victorian survival here. Either side are two windows, one with some surviving medieval glass in the tracery, the other with excellent 19th century glass, thoroughly in the spirit of its medieval predecessors. It even recreates the familiar sense of an amalgamation of medieval glass collected from elsewhere - but it isn't. I wonder who it was by. Finally, the glass in the east window. As far as I'm aware, this artist has also not been identified, but it is a good complement to the tilework of the sanctuary, a serious crucifixion of the 1870s perhaps.